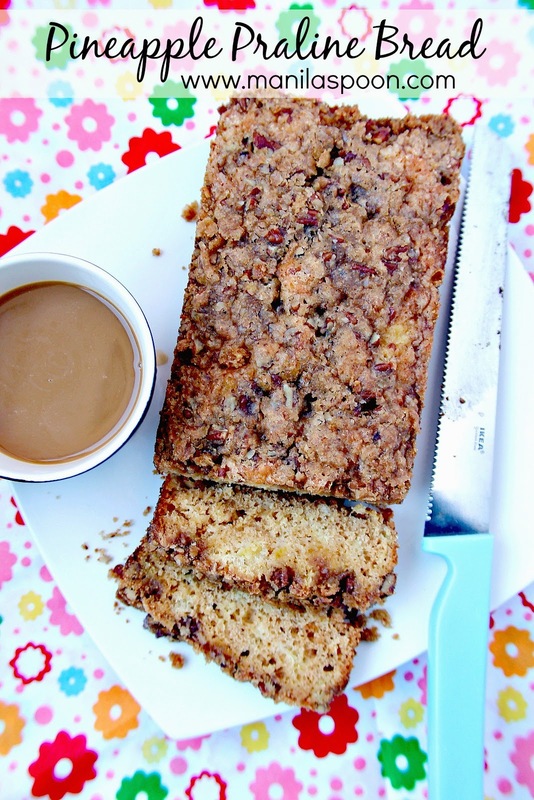 Crushed pineapple makes this Pineapple Praline bread super moist and flavorful. No butter or oil is ever used in the batter. The crunchy pecan topping makes it even more scrumptious. The Philippines is well known for its Pineapple. We have hectares and hectares of plantations of this juicy, sweet-tangy fruit in the southern part of the country. I remember the first time my husband Mark came to our country over a decade ago. He tasted some pineapples and declared that it was the tastiest pineapple slices he’s ever had. I didn’t really care much for what he said then as pineapples were no big deal in our country, almost something we take for granted as it’s quite common and ordinary. However, as it usually happens when you suddenly realize that you no longer have the same things around when you transfer to another place; you crave what was once familiar. So when I see fresh pineapples I buy at least one. I have even dared peeling it on my own, something I have never ever done when I was in the Philippines. Glad I learned how to do it. Now comes this delicious and easy to make bread that’s full of pineapple flavor and juiciness! The good thing is, you don’t need to actually get the freshest pineapple around though am sure that would make a big difference. A good quality canned one will do. Most of all, not only does this bread boast juicy goodness it is also topped with a crunchy, nutty super yummy topping. Enjoy! Click on the icon above to print. To delete the photos for printing, click on the image box and choose “O”. Crushed pineapple makes this bread super moist and flavorful. No butter or oil is ever used in the batter. The crunchy pecan topping makes it even more scrumptious. In a large bowl mix the flour, baking soda, baking powder and salt. Combine the eggs, sugar and crushed pineapple in another bowl. Blend well. Pour the egg mixture to the flour mixture; stir to mix. Fold in half of the pecans into the mix. Spoon the mixture into a greased or parchment paper-lined 9×5-inch loaf pan (if making one large loaf). Sprinkle the remaining pecans on top and gently press into the batter. Bake for about 45-50 minutes or until a tester inserted in the center comes out clean. Cool the bread in the pan for 10 minutes. Transfer to a rack. In a saucepan melt the butter with the sugar. Let boil for a minute. Spoon sauce over the bread covering it entirely. Alternatively, you can melt the butter and sugar and then add the remaining pecans and spoon this over the bread batter before baking. Bake as instructed. 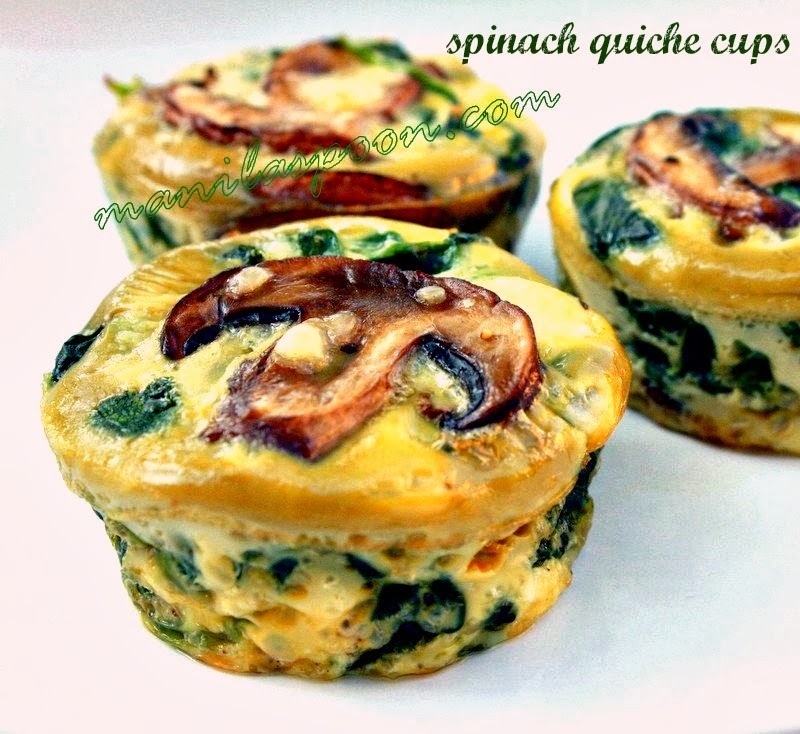 I have tried both (see second photo for the alternative method) and they are both yummy. Let it cool completely before slicing. Enjoy! This recipe is super easy to make and delicious! So glad you enjoyed the recipe Tina. Appreciate you stopping by. Thanks. Ito sarap,can't wait to try it salamat po. I can eat this everyday, truth be told Catherine. Glad you stopped by. 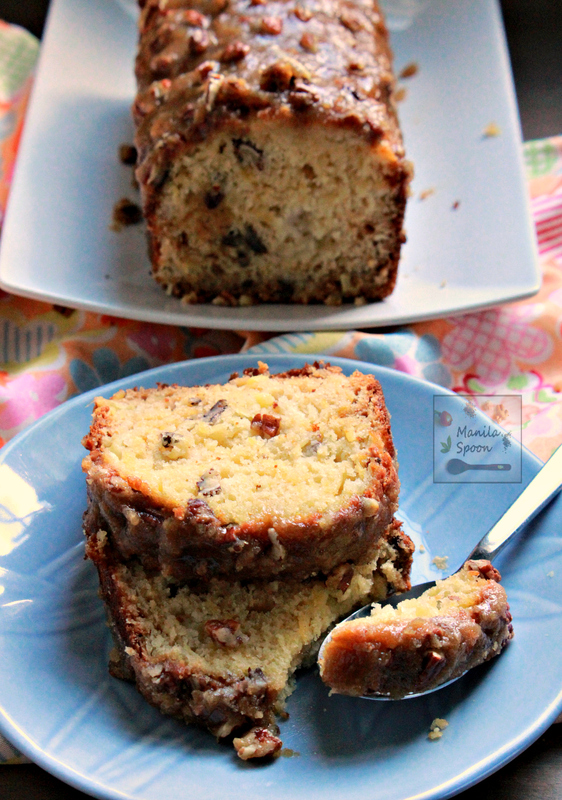 Oh my this looks so scrumptious and with the perfect crumby texture! Pineapple and prailine?!! Oh my this looks incredible! I melted the butter and sugar and the sugar is like a solid and the butter separated from it. What can I do? I wanted something different and when I came across this recipe I had to try it, I'm a huge pineapple fan! I made a double batch – half into muffins for my mother and a loaf for myself. Its so moist and tasty – even without the praline topping (which I didn't make because of time and ingredient constraints lol) Next time I will definitely make the topping, I can only imagine how tasty that is! Delicious! I will be making this for. The 2nd time. This time for my mom's birthday! I would love to make this bread. Your picture makes it even more tempting. Just found out I have an egg allergy so will have to figure out how to substitute eggs. Try using applesauce instead of the eggs. When I was on a low fat diet, I would use applesauce in my recipes. I’ve also used prune purée. Holy crap this is tasty! We finally got a break from the summer heat today and I wanted something different for breakfast. Even though the house was nice and cool I didn't want the oven on for a longer time so I made these into muffins instead. I got 12 huge muffins! I made the praline and poured a bit on every muffin before baking and it turned out amazing. I can't stop eating them! This bread is like candy!!! So good and easy too! I put the praline topping on before baking (1 – 9×5 loaf pan) and I was so disappointed…at first. Now let me tell you that the praline topping sunk down into the bread and I was sure it was ruined. NOT!! Where the topping sunk down into the bread is the best part…like candy!!! Now I'm passing it down in my family. Fabulous!! This was very good! Thanks for the recipe! it looks amazing can not wait to try it. I would just weigh it to be sure. I used crushed pineapple so you can puree the pineapple if you like. Thanks and hope you enjoy this bread. Hi-Thanks for the recipe and pics! Trying this the first time! Sounds/smells great! I wonder if you can tell me, when do you pour topping on bread? I baked it but should I pour while warm, on rack or after it cools down? Thanks! I usually add it while still warm and after I have transferred it to a rack. Just make sure you have something underneath to catch some of the sauce. Thanks! This recipe is absolutely wonderful. So easy to make and so delicious. Thank you so much for sharing this! Looks like you did great in reducing it by 1/4 cup. I haven’t used a 20 oz can and wonder if that would make the bread a big soggy or perhaps require longer baking time. Worth a try though. 🙂 Thanks for stopping by. Thanks for your quick reply. Enjoying your recipes. Have a great day! I love this bread. I make it every Christmas. Can you tell me about how long it would take to bake in oven if I divided it up into two small loaf pans? Thanks and glad you like this bread. I haven’t really divided this into 2 loaves but I would try 30-35 minutes. Insert a tester around this time and see if it’s good, and if not, bake until tester comes out clean. This bread looks delish. I want to make right now. Can you use self rising flour instead of the all purpose flour and baking power/soda? I don’t think it should be a problem though I haven’t tried that myself. Let us know if it worked. This recipe is wonderful. I am a pineapple and nut lover. And this is so moist. Thank you for sharing this. So glad it worked well for you. It is delish indeed. Thanks for the feedback! I made this last week, it was wonderful. This is my second time and I put the topping over the batter before baking it. It’s wonderful! do you use a mixer or just a spatula? You can just use a whisk if you like. That’s what I use. Hope you like this. Can’t afford Pecan’s so substituted crushed graham crackers on top. It worked and really yummy. That sounds delicious, too! Glad it worked out. Thanks!